IT IS THE MISSION OF THE IDAHO PROSECUTING ATTORNEYS ASSOCIATION -- To educate, train and assist Idaho's Prosecuting Attorneys in the pursuit of justice; to foster and encourage communication and cooperation between Idaho's Prosecuting Attorneys and their partners in law enforcement; and, to be the voice of Idaho's Prosecuting Attorneys in support of their efforts to protect the rights and safety of the people. The Idaho Prosecuting Attorneys Association is excited to offer the 2018 Idaho Criminal Code Index for prosecutors and our law enforcement partners. 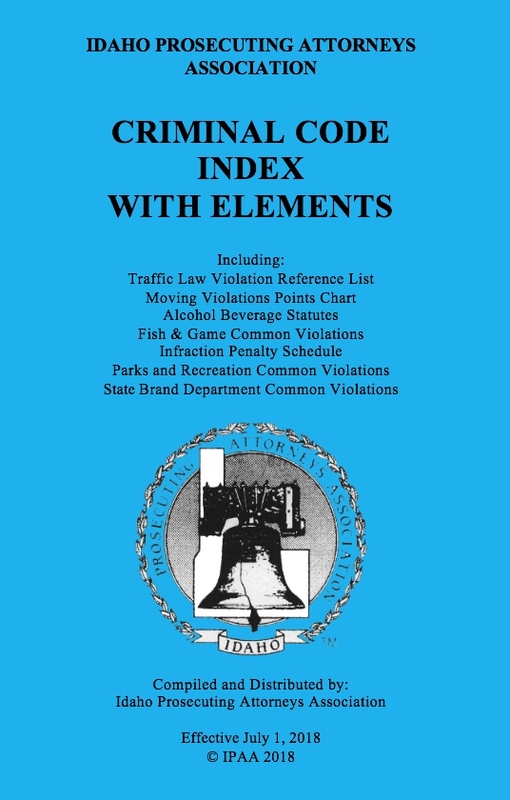 This quick reference guide includes the criminal code index, traffic law violations and points, alcohol beverage statutes, fish & game violations, parks & recreation violations and state brand violations.